TV: KDL-40EX500, it is very old, obviously it doesn't have built-in wifi display funtion. I tried other not-Sony tablet and laptop with Windows 10 installed, works fine as well. Updating farmware (to May 2015 released version) on MIcrosoft WIreless Display Adapter. Note: to update firmware, I had to use Windows machine connected to the adapter. Hope this will help others who is wondering. I´m also annoyed and exhausted with solving HDCP problem. I have the Sony Xperia Z Ultra and the latest updates of Android OS. I tried your cable DL-MC30 to connect with my HDTV monitor Samsung lt24d390ew with MHL support builded in. No chance to turn the mirrong on. Then I tried some cable from Hama and the result was the same. Now I have Micrsoft Wireless Adapter and again it doesn´t work. Where is the problem? Is there chance to turn the mirroring on? Or the Sony is making fun from me? Because my Lumia 730, cheap device comparing to Xperia Z Ultra, works perfectly. Any solutions for Windows 7? Is it the one, you have used for firmware update? The issue is that Microsoft Wireless Display Adapter is not fully compliant with the specification for HDCP 2.2. We have made a workaround for this so that it will work anyway but the software update containing the workaround is not released for Z1, Z1 Compact and Z Ultra yet. It will be included in the next maintenance release for these models. For Z2 and Z3-series the workaround is already available which is why it works with these models. Thanks for letting us know! Seem the HDCP issue is fixed in the latest firmware for the display adapter then. Ok Rickard, thanks for reply. And what's the date of maintenance release? I understand that Microsoft does not fully support HDCP standard, but why you complicate life of common users with these digital certificates? HDCP is used for content protection. It's required by some content providers. 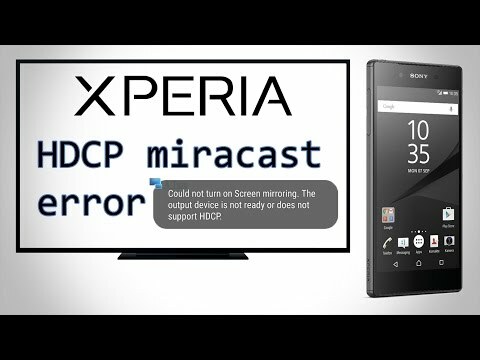 I have the hdcp error with my Sony Xperia Z2 Tablet, i can't connect it to my Samsung TV. It works finrf with my Xperia Z5 and my Xperia Z3 Compact, but not with the Z2 Tablet. Where is the error? My TV has the latest Firmware on it, and is i wrote it works with the two other devices. I tried many different methods but was not able to get it done, then came to know that it has something to do with TV, then tried resetting tv it worked as charm.